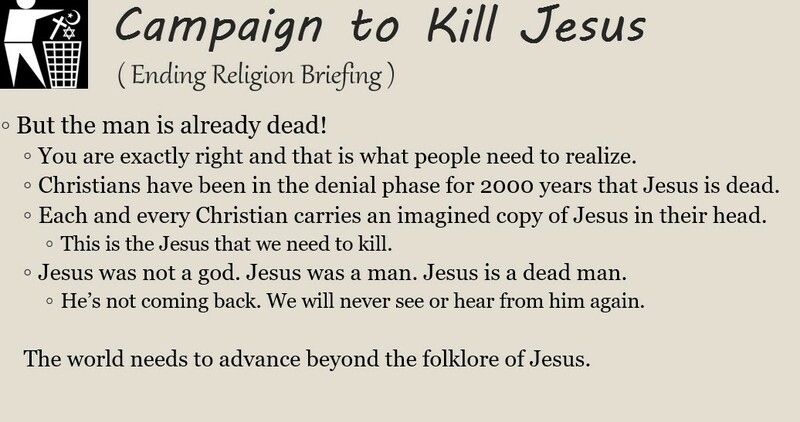 What is the "Campaign to Kill Jesus"? 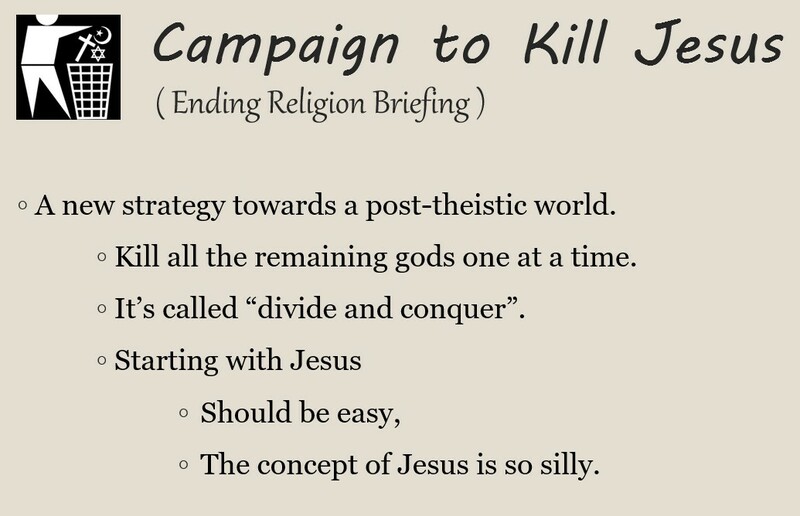 The Campaign to Kill Jesus is part of a larger, noble undertaking by the Atheist Messiah to end all religious belief. 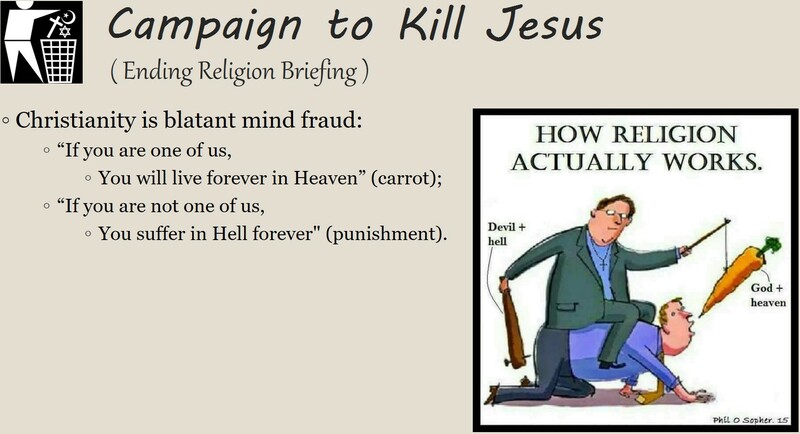 Why is it to kill Jesus only? 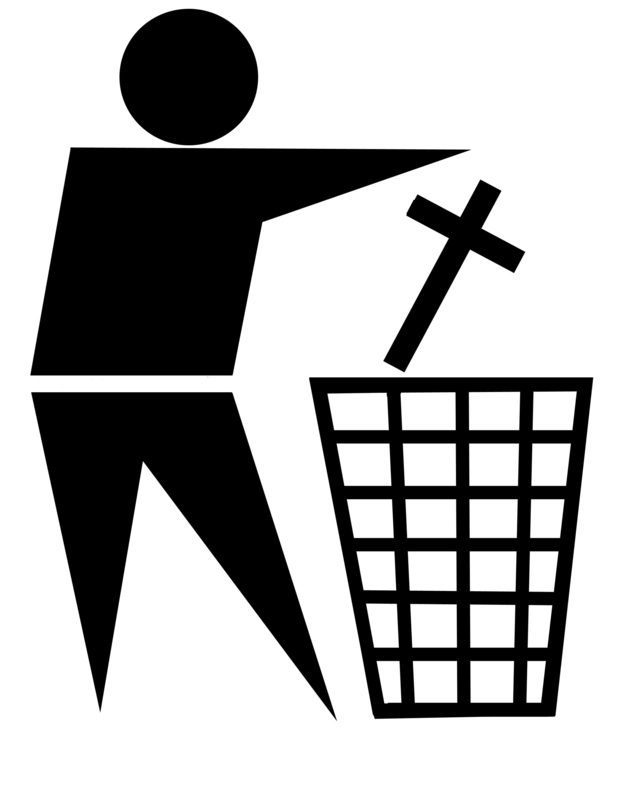 While the long-term objective is to kill the belief of all remaining gods, the short-term objective is to firstly kill the belief of Jesus as being a god. The strategy is called “divide and conquer”. It may be impossible to snap a bunch of sticks in half across your knee all at once, but if you separate them from the bundle then it becomes easy to snap all the sticks. 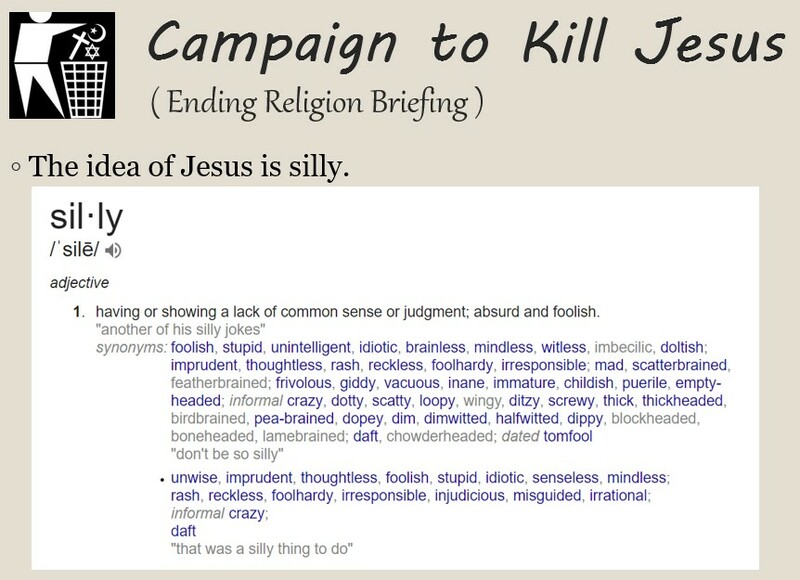 Killing Jesus first offers the biggest bang for the buck. The concept of Jesus is so silly, and therefore it should be easy to have people come to realize this fact. Christianity is very widespread throughout the world and the sudden abandonment of this god would bring into question the existence of the others. But the man is dead already! You are exactly right and that is what people need to realize. Christians have been in the denial phase for approximately 2000 years regarding the fact that Jesus is dead. Each and every Christian carries a unique imagined copy of Jesus in their head and this is the Jesus that we need to kill. It’s not a majorly upsetting event in a person’s life to no-longer believe in a god, it’s about equivalent as coming to grips with the fact that Santa Clause is not real—and many people liken this to part of growing up just as is no-longer being afraid of the dark. Jesus was not god. Jesus (of Nazareth) was a man. Jesus is dead now—he is not coming back to us and we will never see or hear from him again. ok, but why is this so important? 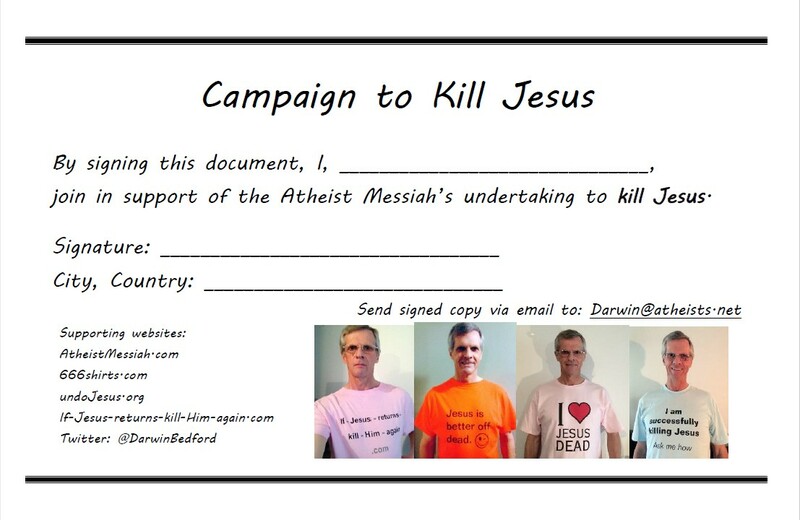 You can help the Atheist Messiah with his undertaking to kill Jesus by printing this pledge form, signing it, scanning it, (or snap a picture), and emailing it back to darwin@atheists.net . When an impressive number of pledge forms accumulate, they will be shown to politicians to persuade them to eliminate tax exemptions for churches. The forms will not be posted on the internet, but you are welcome to post your own signed copy . If you are afraid of going to Hell, then don't. You can also download and print this PDF of the pledge form. Another way that you can help is by sending advice to the Atheist Messiah by emailing darwin@atheists.net . The Atheist Messiah feels that he must share some of the responses to this website. Click here to view the emails that have been received from his websites since this webpage was posted. The email addresses have been deleted. Any emails stating that the email is not to be shared has been excluded. Many one-liners and straight quotes from the Bible are also not included.